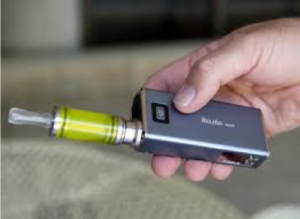 Vaping looks very similar to smoking, but instead of lighting a combustible cigarette, users have a device with a heating element that heats up liquid (called e-juice) and they breath in the vapor. There is a large variation in devices. Some devices look like traditional cigarettes and are easy to identify while others look like pens or flash drives. 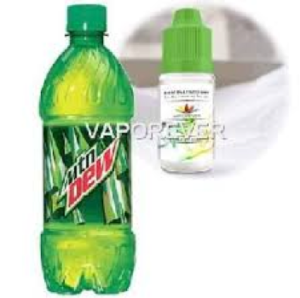 One of the reasons vaping is so popular with teens is that it is a discrete and concealable way to smoke. Many adults don’t recognize vape devices when they see them. Below are just a few vaping devices. 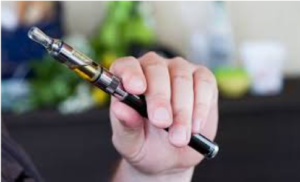 The most common e-juice in pre-packaged, disposable e-cigarettes is nicotine mixed with propylene glycol, vegetable glycerin, other solvents, and flavorings. Due to loose regulations even products that claim to be nicotine free often have nicotine in them. Though e-juice is composed of few ingredients, when heated to produce an aerosol (vapor), over 33 harmful chemicals are produced. These chemicals are inhaled directly into the lungs. With vaporized alcohol, a person can inhale the equivalent of 10 shots in a few seconds. Because it is vaporized, it is impossible to know how much alcohol a person is actually consuming. Vaporized alcohol bypasses the body’s natural defense against poisoning, vomiting. If too much alcohol is inhaled, there is little that medical professionals can do since pumping the person’s stomach is useless. This is a very dangerous practice as alcohol poisoning can be fatal. 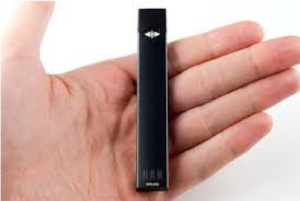 JUULs are vaping devices that look like a flash drive. They are discrete, convenient, trendy, and teens are 16 times more likely to use them than adults. 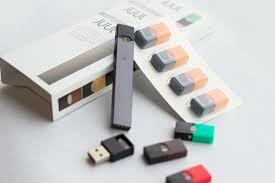 E-juice for these devices come in pre-filled pods with each pod containing as much nicotine as an entire pack of cigarettes. JUUL claims that their products are only for adults, but that hasn’t stopped teens from getting them. Recently JUUL has come under scrutiny from the FDA for advertising to teens. It was announced that the FDA will be taking drastic steps to reduce teen use, but the best way to keep any vaping device out of the hands of teens is parent involvement. Nicotine: addictive substance that is found in traditional cigarettes. In 2014 the environment Protection Agency of United States banned use of nicotine as a pesticide due to the harmful effects on mammals. Formaldehyde: commonly used as an industrial fungicide, germicide, disinfectant, and as a preservative in mortuaries and medical laboratories. Toxic when chronically inhaled. Benzene: a known carcinogen and is a natural part of crude oil and gasoline. Propylene Glycol: a man-made liquid substance found in antifreeze that irritates mucus membranes (eyes, nose, throat, etc.). Acrolein: Used as a major ingredient in pesticides. Contact through the lung membrane can cause cancer. Diacetyl: The chemical found in certain flavorings that is linked to popcorn lung. Many others (for a more comprehensive list see http://www.gaspforair.org/gasp/gedc/pdf/E-CigSmoke.pdf ). The addictive component of vaping is nicotine. The Surgeon General has warned that nicotine is as addictive as cocaine or heroin. Some brands of e-juice claim to be nicotine free, thus not addictive. The FDA studied the ten most popular nicotine free e-juice brands and found at least trace amounts of nicotine in almost all of them. Why would companies sneak nicotine into their products? Like the traditional cigarette industry, these companies are more concerned with profit than your health. Companies know that if they can get a teen hooked on their product, they will likely have a life time customer. How do companies get away with mislabeling their products? Until recently the FDA did not regulate e-cigarettes and products. Steps have been taken to remedy this problem, but it may be some time before we see any meaningful regulation. Until then, there is no guarantee that the product you are using is nicotine free. If your doctor is recommending a substance that is not recommended by the FDA and has no studies verifying its efficacy as a quitting aid, you need a new doctor. In the past Tobacco companies claimed that they were making their products safer, but time told another story. These ads are using well-known celebrities like Tom Selleck (Magnum Pi) and Stephen Dorff (The Blade Series) to endorse their products. By using famous actors, each product is portrayed as a popular choice. These ads are using a childhood icon, Santa Claus, to endorse their products. It may be several decades later but similar tactics are being used to promote a new source of nicotine. These commercials are both endorsed by famous actresses. They are centered around attracting and/or appealing men. These products are being marketed directly to children and teens. 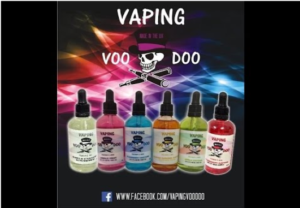 With flavorings such as cotton candy, Mountain Dew, Jolly Rancher, cupcake, etc. it is no surprise that this is a popular trend among teens. More disturbingly is the rise in small children with nicotine poisoning because they drank the e juice thinking it was a product for children. When vaping became popular in the United States the number of calls to poison control for toddlers with nicotine poisoning sky rocketed. These messages are targeted directly to teens who are particularly susceptible to rebellious messaging. THE COST OF VAPING: IS IT REALLY FREEDOM? The average person who vapes will spend between $50 and $100 per month on vaping supplies. That’s $600-$1200 per year. Over the course of 10 years that amounts to $12,000. Over the course of 30 years that amounts to $36,000. This doesn’t even factor in the increased health care costs. Developing an addiction that will interrupt your daily activities, cost you a significant amount of money, and ruin your health is not freedom. In 2016, the FDA finalized a rule extending their regulatory authority to cover all tobacco products, including vaporizers, vape pens, hookah pens, electronic cigarettes (E-Cigarettes), e-pipes, and all other ENDS. The FDA now has the authority to regulates the manufacture, import, packaging, labeling, advertising, promotion, sale, and distribution of ENDS. This includes components and parts of ENDS* but excludes accessories. For a full definition of ENDS components, parts, and accessories, please read the Deeming Tobacco Products To Be Subject to the Federal Food, Drug, and Cosmetic Act. It may be some time before we see meaningful regulation of these products. – Unfamiliar devices that look like pens, tire pressure gauges, etc. In 2014, e-cigarettes were the most commonly used tobacco product among middle and high school students. E-cigarette uses triples among middle and high school students in just one year. E-cigarettes are being aggressively marketed to youth. Aerosols contain heavy metals and ultrafine particulates as well as many of the same chemicals that are in traditional cigarettes. Benzene is a known known carcinogen. Formaldehyde is harmful when chronically inhaled. Propylene glycol irritates the mucus membranes. In Idaho, vaping among teenagers is twice the national average. Teens who vape are 3-4 times more likely to smoke in one year. Water vapor acts as an immunosuppressant. Vapers are more susceptible to respiratory illnesses. Acrolein is used as a major ingredient in pesticides. Nicotine was used as a pesticide until the Environment Protection Agency of United States banned it because of its harmful effects on mammals. The US Surgeon General has concluded that nicotine is as addictive as cocaine or heroin. Nicotine is a poison to the body that causes cell death, affects brain development, and damages major organs. There are second-hand-emissions that contain all of the chemicals found in E-Juice vapor. Some manufacturers claim that their products are nicotine free. However, tests by the FDA show that some products that claim they are “nicotine free” still have small amounts of nicotine. Wall Street predicts revenue from e-cigarettes will surpass traditional cigarettes by 2025. E cigarettes are not an FDA approved quitting aid. Vaping is linked to popcorn lung. Vaping may lead to heart disease. Marijuana has been shown to slow brain development, especially in youth, as well as lead to loss of IQ and impaired immune response. Marijuana is being altered to produce higher levels of THC, which is the compound responsible for producing the euphoric high. Vaping Alcohol- Single inhalation can be equal to 10 Shots through the lungs. Vaping alcohol bypasses your body’s natural defense against poisoning. Big tobacco is using the same marketing tactics they used to fool older generations into smoking cigarettes. Themes of freedom and rebellion, celebrity advertising, and marketing to children. Students who frequently ran into ads on the internet were about three times as likely to vape as were teens who reported never seeing such online ads.